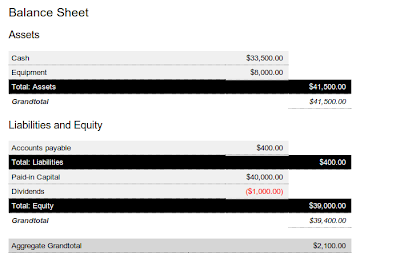 Here's another sample exercise that explains how to use LearnDoubleEntry.org. 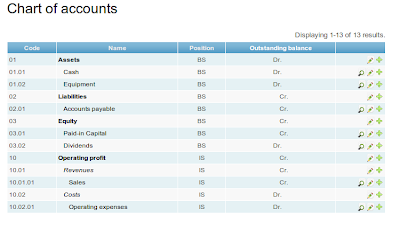 We'll use the example provided by prof. Joost Impink at learn-accounting.com (on the site you'll find more accurate explaination than here), that kindly autorized us to do so. 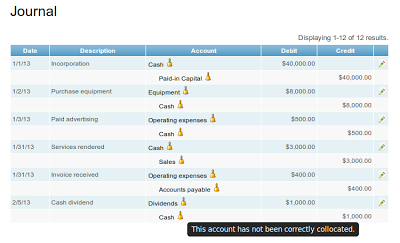 Just to show something different, this time we will create a firm from scratch, so we'll have an empty chart of accounts. The firm is incorporated on the 1st of January. The owner, Betty, pays 40,000 cash for 10,000 shares. Since we do not have any account yet, we can create a new journal post and put an exclamation mark after the name of the account (e.g. "Cash!"). ABCD Inc. buys a Grasshopper lawn mower for 8,000 cash. Since the account "Cash" has already been created, we won't need to add an exclamation mark for it. 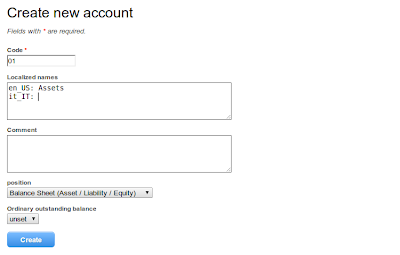 When typing the first few letters of the name of the account, we'll have a list of accounts matching the name. Don't care about the code, for now. ABCD Inc. pays 500 cash for advertising in the local newspaper. ABCD Inc. receives 3,000 cash for services delivered in January. ABCD joins the Association of Landscapers, and receives an invoice of 400 to be payable in February. This time, the account Operating expenses already exists, and will show up when you type its name. The company pays a 1,000 cash dividend. Notice that the codes are generated randomly, and have a ~ sign at the beginning. This goes for all accounts created with the exclamation mark trick. We can easily fix that. 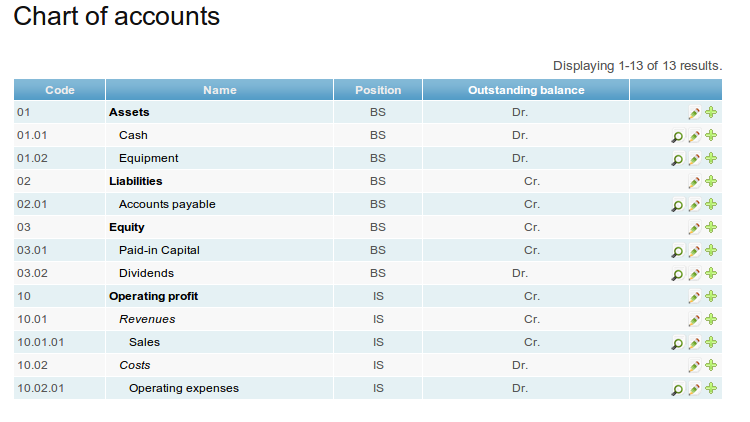 Not only we want to correctly position the accounts, we also want to group them in clever ways. 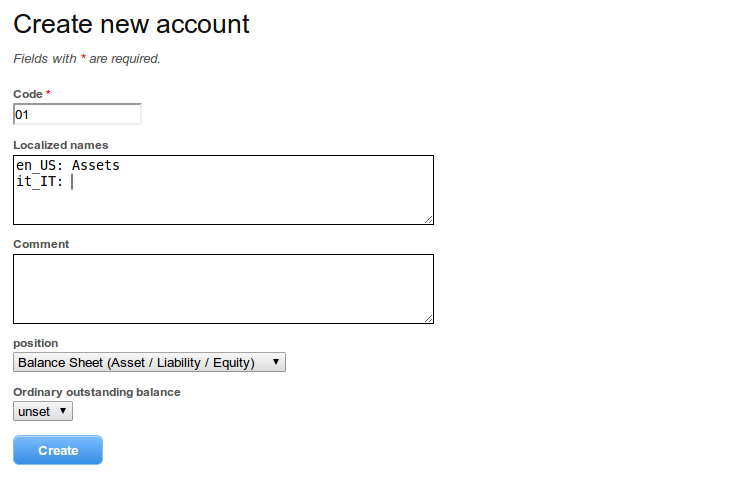 Then, we want to "move" the Cash account under the Assets account. It's as easy as changing the Cash account's code to "01.01". The dot here stays for a parent-child relationship between accounts. You can do something similar with the Equipment account (say you give it a "01.02" code). The same goes for Liabilities, that will contain Accounts payable, and Equity, that will contain Dividends and Paid-in capital. The "position" means that the net amount of the account will be shown up in the Balance Sheet (BS) or in the Income Statement. You can find the complete exercise in its public page, and you can fork the firm by using the slug "sample-exercise-02".